While ingrained in marketers’ DNA, the best content marketing does NOT push or promote products or brands. As marketers we believe we need to constantly blast out messages that scream buy, buy, buy. Yet the reality is that the more that we push sales messages, the less our target audience pays attention to them. Don’t take my word for it. 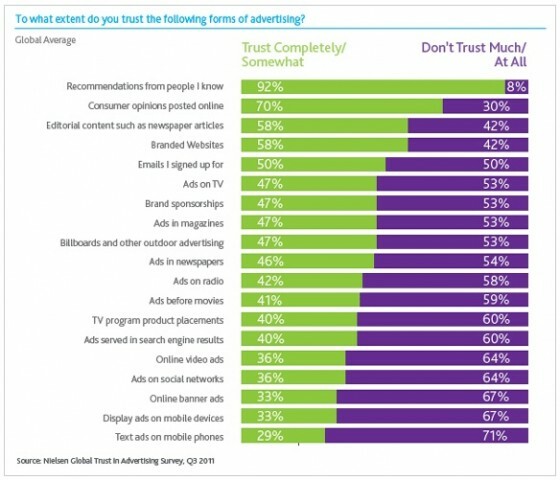 Less than 50% of customers trust any form of advertising, according to Nielsen. This human behavior is so old that it’s documented in Aesop’s fable of the wind and the sun where persuasion wins over force. This logic is at the heart of content marketing that sells without being openly promotional. 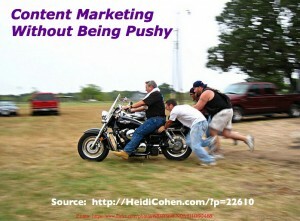 How do you create persuasive content marketing without being pushy? Here are 5 varieties of content that help customers to choose your product or service without being overtly salesy. It’s useful to understand your audience’s content marketing triggers to provide this information. 1. Give me the facts, nothing but the facts. Prospects are looking for detailed product information. Give it to them straight or they’ll look elsewhere. This is one reason that Amazon is the first go-source for many shoppers. Include product comparisons. Where relevant, compare your products to each other as well as to competitors. Marcus Sheridan compared his product to his competitors and ranked for both products. Like ratings and reviews, executives can be nervous about these head-to-head assessments. But not doing them, doesn’t mean that your customers aren’t! Explain how to use the product. Don’t assume that your market knows how to use your product. Think related information. Go beyond the basic details and provide useful information on products and services related to your business. Customers remember that you helped them, even with things that you didn’t sell. 2. Answer your customers’ questions. This is how Marcus Sheridan wrote a blog post that generated $2 million in sales. Get employees to respond to your prospects’ questions. This includes your sales, customer service and other customer facing staff. The bonus is that you’ll reduce duplicate work answering these questions multiple times. Ask an expert. Since customers trust experts, invite them to respond to key customer questions. 3. Offer show and tell. While showrooming has become a significant marketing trend, the reality is that your potential buyers want to see your product in action. Use photographs from a variety of different views. Leverage Instagram. Include videos. This is one of the reasons that YouTube is the second largest search engine. Don’t overlook the use of Vines and Instagram Video. Offer related product information. Show your products in use in real life. This is a great way to show related articles. Here’s where Pinterest can be useful. 4. Integrate your brand into useful information. Integrate your product into information your audience finds useful. This requires looking at your product and content from your audience’s perspective so that you can be subtle and incorporate what Jonah Berger calls a Trojan Horse. Offer research. Help your potential customer make the case for purchasing your product. Useful information in the form of white papers and presentations (or ebooks and Slideshares) can persuade. Give them checklists. Give your audience useful information that they’re going to print out and use or send to their mobile device. Include your brand name and a link to the product page of your website where appropriate. Supply recipes. Furnish your target users with an easy-to-follow recipe including your products. Where appropriate include photographs to make it more enticing. Make patterns available. Another how-to approach that helps your audience to use your product, often for a DYI project. Show them styling tips. Show your products in context. 5. Offer other people’s input. Before you freak over the potential response from customers, understand that there are different types of ratings and reviews. From a content perspective, take reviews one step further than a check box. Get customers to explain how they use your product. Many B2B firms do this in the form of webinars. For example, Kapost did a webinar on Slideshare to tell their story with a client. Review other people’s products. This is a blogging mainstay. Pat Flynn drives a lot of revenue this way. Love notes by themselves don’t cut it. You should tell the good and the bad. Give your customers a platform to strut their stuff. This works especially well for product. 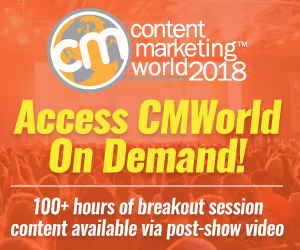 Here are 5 actionable content marketing tips to ensure your information converts to leads and sales without being pushy. Link to your product page where appropriate. Make sure that the page continues the same branding and scent. Enable sharing including printing. 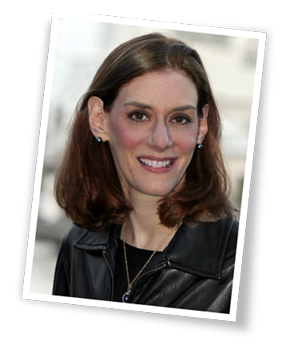 This is particularly important for purchases that involve other influencers. Incorporate a call-to-action. Remember, we’re trying not to be pushy. Gently suggest the next steps to take. Provide for on-going communications. For many marketers, this means gathering an email address or mobile number that enables you to stay in touch with the prospect as they continue their research and consideration. Track results. Plan for and include relevant content marketing metrics and tracking to monitor results. Despite your inclination to continually send pushy sales messages, recast your information into persuasive content to give prospects, customers, end users, influencers and the public information they seek and help them to use your products better. It will help you be a better content marketer and generate more sales. What type of content marketing resonates with your key audiences without being promotional? What other content recommendations do you have? Tags Marcus Sheridan, Nielsen, Pat Flynn, sell. Bookmark the permalink. Great post! This is really helpful, since you break down exactly how to create persuasive content marketing into 5 easy steps! However, I have to admit that I do find myself wanting to create “pushy” marketing content from time to time (it’s so hard not to!). Thanks for your insight!